Kevin and I are SO excited! Having an ultrasound definitely made it seem more real that I'm pregnant and we're expecting a baby! 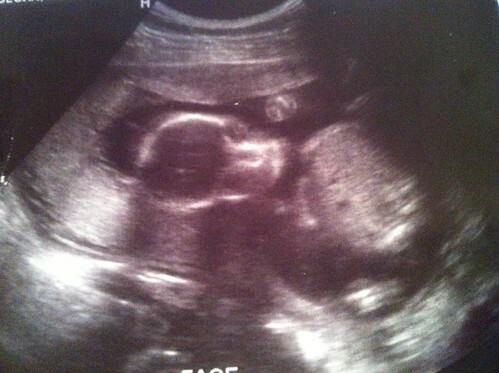 I had been counting down the weeks and days until this ultrasound on April 12, 2012. We didn't get the 12 week ultrasound to test for genetic testing so waiting 20 weeks seemed like forever!!! 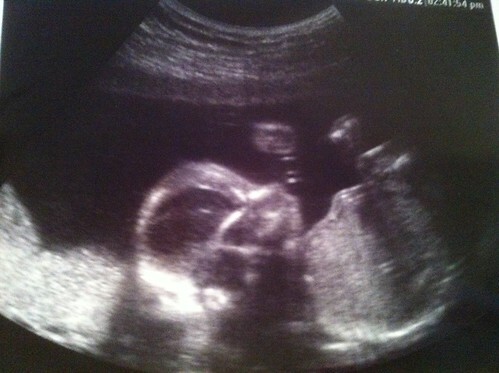 Finally it was time to see our baby and hopefully find out the gender if the baby cooperated, which he did! The ultrasound started and I was just trying to figure out where the baby was because in all honesty, whenever people posted ultrasound pictures I was like, "Okay...where is it? What is what? Cool?!" Haha. I think I got it figured out! So, the ultrasound tech started and all of a sudden I saw a crotch shot and there was definitely something there...so I said, "It's a BOY!!!" Kevin didn't see what I saw and the ultrasound tech changed the view and didn't really say anything lol. I had seen some crotch shots online of friends babies and whatnot so I kind of knew what the view was like. She started taking pictures and doing measurements of the baby and our boy was moving around like crazy! He was literally folded in half with his legs up by his face. He was kicking and punching but he wouldn't fully stretch out lol. It was so crazy to feel him kick me and then a second later see it on the ultrasound screen; I kept saying "OH man I felt that one!" Haha. I've been really feeling him move around lately! Then she found the view that I saw earlier and was going to check on the gender for us...she showed us the view and I said, "It is a boy!" She said, "Yep, he is definitely a boy!" Kevin and I were so excited! Then I asked, "Did you see that view earlier when I said it's a boy?" She said, "Yes I did but I wanted to be sure on the gender." Ha so I love how I saw it on my own. 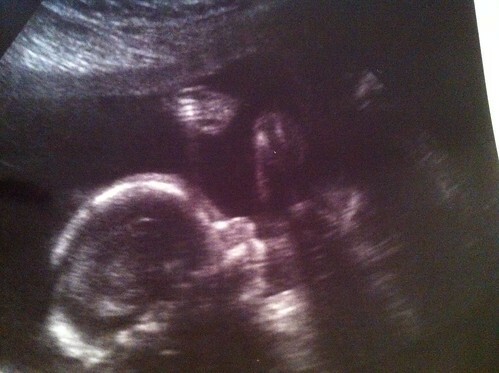 There is his little face and body! 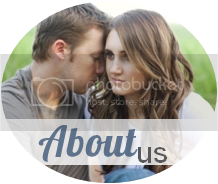 There is his profile! When my mom saw this picture she said "Is he blowing bubbles?" Honestly it is hard to know whether arms are arms or legs are legs, if that makes sense. 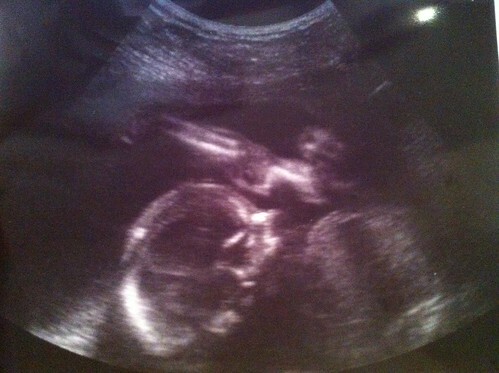 He was moving SO much it was making it it hard on the ultrasound technician. There is his face again and body! Can you see all of that black space to the left? Well, he wouldn't stretch out (he could move to the left a lot in that black space) and just kind of was hanging out in the right side of my body so there were a couple of pictures that the techs couldn't get. I think they need a low spine picture, another of the heart, and maybe that is it but because they couldn't get good pictures of those we are going to have to come back for another ultrasound in a week! They even tried poking my belly a lot and he wouldn't scoot over and stretch out haha. I decided our boy was being stubborn and not letting us get his pictures, just like his dad! Kevin is stubborn and doesn't like his picture taken a lot...so like father like son I guess haha. 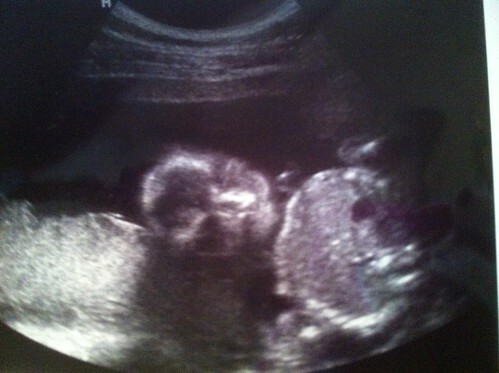 It is more than okay with me to go back and see our boy again :) We get to see him April 23, 2012 for the second ultrasound. Everything about our boy looked great and he is healthy thus far so I think we are good to go! They guessed his weight as 13 oz. and his heartbeat was 140 beats/minute! After the ultrasound we had a obgyn appointment which was good. Then Kevin started calling his family and telling them the news! 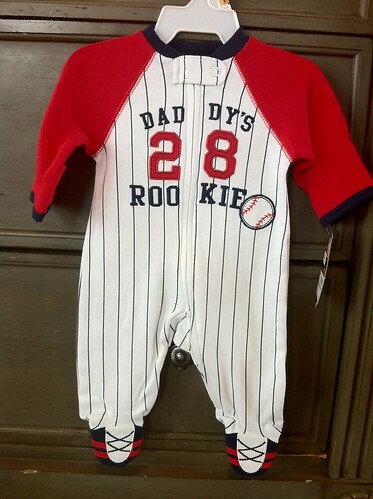 Meanwhile I drove to Babies 'r' Us and we then picked out a boy-ish outfit (one below). We drove to my parents and brought in a gift bag with this outfit in it and pink and blue tissue paper sticking out. My mom opened it up to find out the gender while my dad and his parents were on Skype (he is in Wyoming visiting them). My mom and Omi (she is helping my mom recover from her 2nd hip surgery) were there along with Hunter and Zach. My mom, Omi, and the boys thought a girl so they were surprised! By the way, we got that baseball outfit since Kevin played Baseball for BYU and there was no way we would get another outfit to show the gender ha. We are seriously so excited to know the gender and know that we are having a boy! People have been asking "Do you have any names picked out?" We will now begin to think harder and figure out a name for our little guy. We also hit up Babies 'r' Us last night to start checking out strollers, car seats, etc. to become informed. We talked to an employee for an hour and a half and think we decided the route we will go. We will get a 3 in 1 set up: stroller (for infants/toddlers up to 50 lbs), infant car seat (up to 22 lbs), & base. We're going to pass on the jogger stroller since well, I don't run that often and I don't think it is necessary. We are looking at the Chicco ones. We'll probably get a lightweight stroller a little later and an infant/toddler seat for when the baby outgrows the infant seat. Anyways, if you have any recommendations on baby things at all, I'd love to hear your advice on products, etc. or if there is a baby thing you cannot live without we'd like to know! SO excited for you!! :D COngratulations! I also expect to have the ultrasound test on 24th this month. I was wondering to ask the gender or not but now I feel I'll definitely!! That's so exciting, your going to be such a cute mom especially for a little boy! I saw this on twitter and can't remember if I said anything.... AH! I am sooooo excited for you guys! You should also get swaddler blankets, and a Moby wrap for him. They are amazing. Congratultions! Boys are the best! I have the chicco carseat/carrier/stroller, high chair and pack n play. I have no complaints. I do wish though that I would have checked into the Britax carrier and stroller. Maxi cosi also has cute carriers. I know how over whelming looking and finding baby stuff can be. But Chicco and Britax would definitely be my top picks. Oh and something to think about when it comes to carriers is to make sure it has a straight bar (not the ones with the triangles or "z" shape) I used to hook my arm through the bar to carry it, it's so much easier to do it that way. Another neccesity, the muslin swaddle blankets, I LOVED the gowns instead of button onsies (yes, even for a boy), mittens so they dont scratch themselves, a hand pump incase you become engorged (if you plan on breastfeeding) binkies, and I love the Burts Bees shampoo. The johnson and johnson shampoo uses some kind of formaldahyde in it. Sorry, I always have a lot to say. I guess it's b/c I had my baby a year ago and all of this is still fresh and things I wish people would have told me. Congratulations! Boys are so very fun, I have two :) He sure is one flexible guy! Love the pic of his leg by his head, amazing! Cute outfit! I recommend some kind of nursing pillow (I used a Boppy and was fine with it.) They eat all.the.time and after 3 or 4 times it starts to hurt your arms/neck/back etc. so make sure to have good posture and a pillow can help with that. I loved having a combination- where the carseat connects right to the stroller. For the first like 3 months they will fall asleep within minutes of a car ride and I can only imagine how frustraing that would be to have to haul the carseat around or take them out of the seat into the stroller. The combo is the way to go :) As for brands- we used Graco but we use ours all the time (daily walks, airports, library etc) and I think it has worn out pretty quickly. If it were in our budget I would have liked to get a better quality stroller- especially if you are a busy family. Congrats on the boy- the clothes aren't as cute but they are so precious anyways! YAY! Congratulations girl! So exciting!